Winter getting you down? Sick of trading your summer colours for grim grey? We hear you. 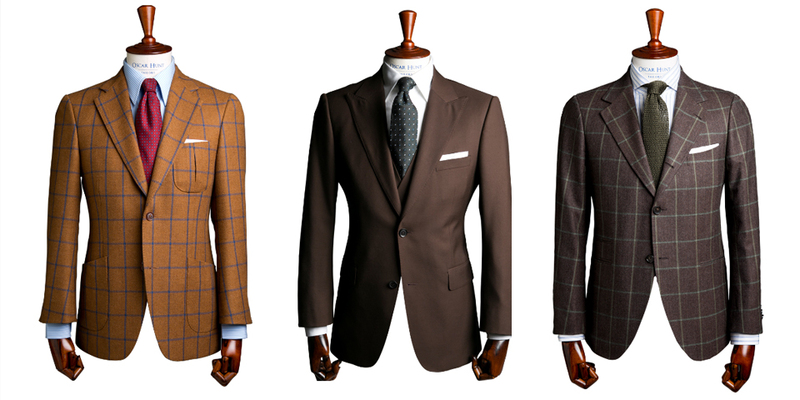 While the weather might be somewhat depressing, your business attire doesn’t have to reflect the sombre atmosphere. Kick those winter blues and introduce some warm tones into your wardrobe for a much-needed dose of Vitamin D.
Made-to-measure tailoring provides options you’d never find on the rack, and this extends to colours that stray from the norm. Rather than the business staples of navy, grey, charcoal and black, think about other smart colours that are unexpected. Browns come in a spectrum of shades—from chocolate to caramel—and have made a resurgence for discerning gentlemen everywhere. In fact, browns benefit from a great variety in winter-weight fabrics. And if you choose a patterned cloth expect to amp up your wardrobe game to overload. If brown isn’t your thing, then perhaps you’d consider working green in with your greys. 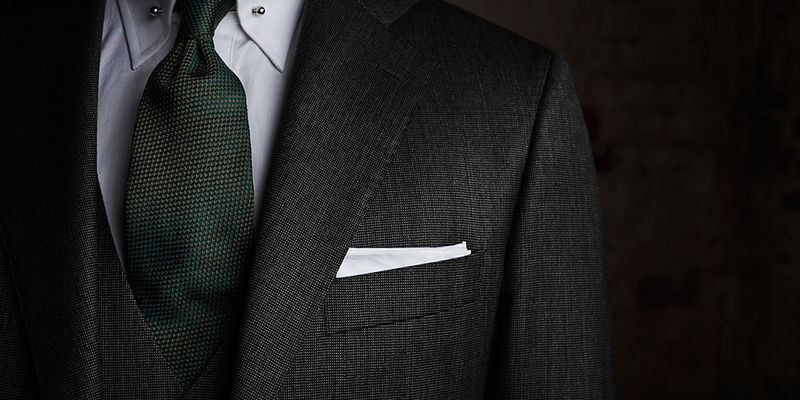 Dark green and dove grey are elegant together and evoke the British countryside, or mid greys with a fine lime windowpane check are a daring choice for corporate wear. Looking for something a little simpler? Try maroons and burgundies to lift your dark suit. Accessories like pocket squares and ties are a simple way to build a look, or a maroon scarf over a grey or camel overcoat are a warm welcome. Consider adding an extra layer to your ensemble with a waistcoat or a woollen or cashmere knit. A waistcoat in the same fabric of your suit will make you look even more coordinated and fastened up. Likewise a plain contrast coloured waistcoat with a patterned suit is a subtle and sophisticated addition, allowing you to experiment even more with colour. When completing your look, there’s more to life than brown or black shoes. Trade in those tired loafers for something with a little more funk. 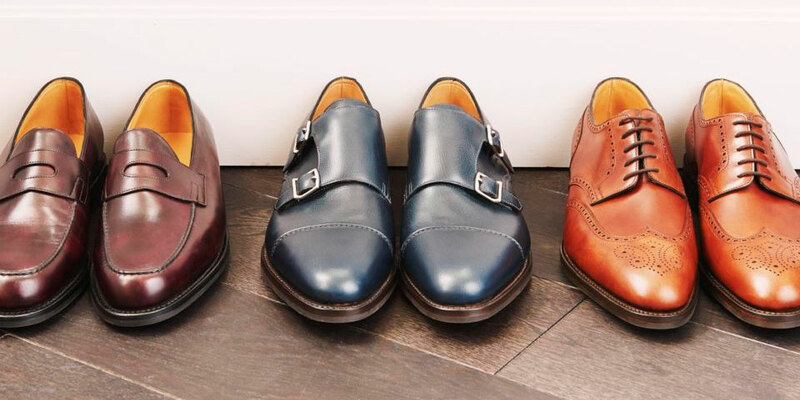 Expand your footwear selection with contemporary classics such as chestnut and caramel for golden tones, burgundy and port wine for a rich alternative to brown, or purple and forest green if you’re particularly daring. Not quite ready to make the full commitment? Try a contrast-colour shoelace for a pop of colour on what would otherwise be a standard business derby. So you see that winter doesn’t have to be the bleak midpoint of the year—it can be your fashion highlight. Make an appointment with your tailor today and turn up the heat with tailoring.